We believe our pets need good quality, nutrient dense foods as much as we do. And that they should be eating a diet appropriate for their species. so were very pleased to find Happy Pet to supplement his diet. jerky (tongue), heart, liver, tendon chews, bones and deer sinew. 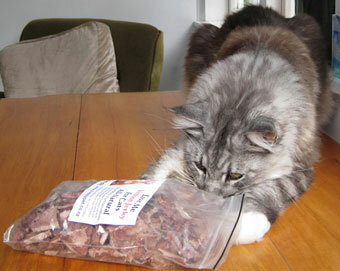 Venison is very good for cats and dogs….and they know it! They absolutely love these treats….watch out for your fingers when you feed them! 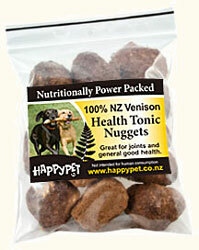 Happypet treats are all-natural and all-NZ products. The jerkies are perfect for breaking into pieces for training dogs, while the tendon chews provide natural chewing satisfaction. Pets with food sensitivities can react to any product with beef or chicken in it, and some can react to flavourings, colourings etc. Happypet’s venison treats are perfect for these pets. These are all-natural, pure, dried 100% NZ venison. Apart from the drying, they are not processed. They are made in Central Otago and contain no preservatives or additives. 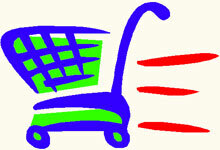 They are premium products made under hygienic, export quality conditions. Three different types of seasonings made from tasty pure venison products, as found in the natural canine and feline diets. These seasonings help to achieve a varied, flavoursome diet, with natural nutrients, for a healthy, happy pet. Ideal for adding to starchy food for dogs (e.g. pasta) and for livening up boring diets. Often a fussy pet can be enticed to eat when a seasoning is added. For pets fed "complete" diets, use just a light sprinkle of one seasoning in a meal to add variety, excitement and unique natural micronutrients. For pets fed a mixed diet, use as a natural meal ingredient and flavouring. The seasonings supply natural nutrients, including minerals and vitamins as well as glycosaminoglycans for nourishing joints. Deer Sinew is cartilage and connective tissue, taken from a special part of the deer, between the hoof and hock. It contains natural glycosaminoglycans. In Traditional Chinese Medicine, Deer Sinew is used by elderly people as a gentle, safe supplement for strengthening weak, aged limbs, and reducing joint and leg pain. It is also used for general good health at all ages. Deer Sinew Sprinkles are a gentle supplement to use on or in your old pet’s food. Suitable even for frail animals (just give them a tiny bit to start with). Even just a light sprinkle daily seems beneficial. HappyPet have had excellent feedback from owners of old pets which have taken on a new lease of life when taking deer sinew. Dogs just love these! Soft, tasty and delicious. Venison – liver, tendon, brisket bone, cartilage, tail bone, blood and natural sausage meal. 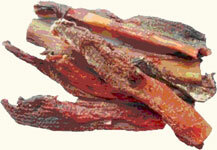 We now order Happy Pet jerky, tendon chews and bones on a special order basis so that they are fresher. If you want to order any of these products, email us to see when the next special order is being done. Dogs will do anything for this stuff! So it's ideal for training. Although originally designed as treats for dogs, cats were found sneaking into places to feast on them. Many cats are really connoisseurs but are fed on a bland diet. These treats will definitely excite them! Available in larger chunks for dogs, or smaller chunks for cats. Clean to handle and easy to break into small pieces. They aren't messy and won't splinter. Help to improve teeth and gum health by removing plaque– many owners consider these are the best product for cleaning teeth. Excellent for satisfying the chewing craving (especially strong in puppies and young dogs) while also providing safe, valuable nutrition. 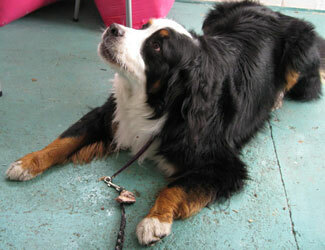 Often dogs have anxiety problems when left alone. Giving a deer tendon before leaving shifts the focus from the owner leaving being a negative, to a real positive - usually the dog won't even look up as you go. Especially suitable for the larger dog. Here's a picture of a satisfied customer with the (very small!) remains of his bone.